(Nanowerk Spotlight) Much effort has been invested into finding a non-toxic replacement for semiconductor quantum dots (Q-dots) possessing bright fluorescence. Intrinsic toxicity of Q-dots composed of elements such as selenium, tellurium, cadmium, and lead severely hinders their in vivo applications for fluorescent imaging. Therefore many carbon nanomaterials have been considered as a replacement for Q-dots for in vivo imaging. However, it is still unclear how safe carbon nanomaterials – in particular nanotubes – are, and this is an obstacle for their use in medicine. Nanodiamond has been an exception among nanomaterials in many aspects, but what is important for biomedical applications is that it has shown very little or zero toxicity in all tests done so far. In addition, nanodiamond powders are already produced by detonation on a large commercial scale. This is why fluorescent nanodiamonds currently attract so much attention. In the past, red and green fluorescent nanodiamonds have been produced by high energy ion bombardment – a process that requires a radiation source and which is neither cheap nor easy. 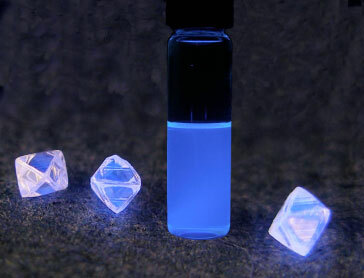 New work by researchers at Drexel University now describes a relatively simple and much cheaper wet chemistry surface modification process which yields bright blue fluorescent nanodiamonds. "We used a fairly simple and common surface treatment procedure that has been previously used to create hydrophobic nanomaterials other than nanodiamond, and which can be implemented on a large commercial scale" Yury Gogotsi tells Nanowerk. "We have been working closely with the US manufacturer of detonation nanodiamond, NanoBlox, Inc., to scale-up the process. Gogotsi, a professor in the Department of Materials Science and Engineering, heads the Nanomaterials Group and the A.J. Drexel Nanotechnology Institute at Drexel University. Together with Vadym Mochalin, a senior research associate in his group, he has just published a paper in Journal of the American Chemical Society (Wet Chemistry Route to Hydrophobic Blue Fluorescent Nanodiamond) that describes a technique to functionalize nanodiamond with octadecylamine (ODA) via the amide bond formation, a process similar to that used for single walled carbon nanotubes (Solution Properties of Single-Walled Carbon Nanotubes). Green and red fluorescence have been achieved in nanodiamond powders by irradiation. However, blue fluorescence was only observed in a small percentage of natural diamonds. Gogotsi's work expands the color palette by adding blue to the available range of colors. "When we started this work, we did not intend to produce a fluorescent material, we just explored ways to make hydrophobic nanodiamond that could be easily mixed with motor oils and hydrophobic polymers," says Mochalin. "Octadecylamine is used as a strongly hydrophobic protective coating for boilers. It was a natural choice for us to bind it to nanodiamond. Somewhat surprisingly, this modification resulted not only in highly hydrophobic nanodiamond, but also rendered it fluorescent. And the fluorescence was so bright that it could be detected with bare eyes under a laboratory UV lamp even at high dilutions." The findings by the Drexel scientists can be used to solve important problems in numerous applications that require hydrophobic rather than hydrophilic nanodiamond – cooling liquids, polishing compositions, or polymer-based composites, i.e. in any application that requires nanodiamond particles of high affinity toward hydrophobic liquids or melts (e.g., hydrocarbons). For example, the use of nanodiamond as a motor oil additive requires its dispersion stability, which cannot be achieved with hydrophilic acid-purified diamond powders. Oils are hydrophobic and nanodiamond bears hydroxyl and carboxyl functional groups on its surface. Therefore, oil dispersions of this material are not stable, with the hydrophilic nanoparticles tending to assemble themselves in large agglomerates up to tens of micrometers in size. Mochalin point out that the hydrophobic material that his team produced allows stable nanodiamond dispersions in hydrophobic liquids. "This will lead to better lubricants, cooling liquids and nanodiamond-polymer composites, since many organic solvents used in polymer processing and polymers themselves are hydrophobic". In the areas of bionanotechnology and nanomedicine, bright fluorescence which is not quenched after many hours of irradiation, in combination with low toxicity of nanodiamond, suggests many interesting biomedical applications for this material. For example, this nanodiamond could be used for imaging hydrophobic components of cells or attached as a biomarker to proteins. In this regard the hydrophobic blue fluorescent nanodiamond nicely supplements the set of already available hydrophilic red and green fluorescent nanodiamonds. The Drexel team is currently foced on understanding the mechanism of nanodiamond fluorescence induced by surface modification. "Once we completely understand it, many other obstacles on the way to producing nanodiamond and other nanoparticles with varying colors of fluorescence will be removed" says Gogotsi. "Another direction we are exploring is the use of fluorescent nanodiamond as a biomarker for cellular imaging". (see our previous Spotlight "Nanotube biological probes for intracellular studies" on Gogotsi's work on using carbon nanomaterials for developing biological nanoprobes).